Well, here we are in the middle of the hot Oklahoma summer while I’m dreaming of cooler days and the dove season only two months away. This year promises to be good for many reasons including the few young hunting companions I will have. My son, John, will be ten in September. He has accompanied me in the dove field before, but this year a new dimension to his hunting will manifest itself in the form of the dog-hunter relationship. 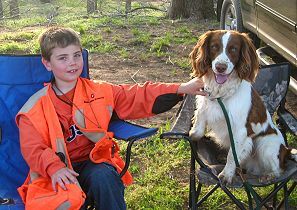 He got a taste of it in April running our fourteen-month-old pup Jake in the spaniel hunt tests at the Bramwell’s in Spivey, Kansas. My wife, Lori, and I have two teenage daughters, also. The oldest is the adventurer - shooter - hunter and the younger is the dog lover - athlete. But both are busy with things that most teenage girls are doing and it's difficult to get either into the field with me right now. John, like our girls, has been around the outdoors and is fascinated by all its wild creatures. Of course, he immensely enjoyed having the litter of puppies around in the spring of 2004. He has shown some natural training instinct with our dogs and they seem to mind him better than my wife or the girls. Naturally, I hoped to get him into hunting and the spaniel games. Like any parent, I hoped to find an enjoyable pastime to share with my kids and to share a true passion is even better. "Like any parent, I hoped to find an enjoyable pastime to share with my kids and to share a true passion is even better." Jake was part of an eight-puppy litter we had in March of 2004. I had originally hoped to place all the pups outside the home with at least one or two locally in hunting homes so I could see them develop. I did manage to place a couple with friends that are now getting into the spaniel games, but as numbers dwindled, it appeared I might get stuck with one. "Stuck" is hardly a good word when it comes to puppies - and especially when the last is the one you have that special connection with. Fortunately Jake is that one. 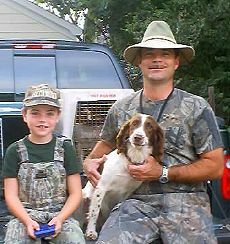 Jake and I were in the field a lot during the year prior to the hunt test. He was progressing nicely. I was steadying him from the start as I had with another dog and everything was going as planned. Jake had a bold flush, good quartering skills and a perfect record of steadiness with a number of flushed flyers. Entering him in a hunt test where the excitement, other dogs and a new handler might encourage a break - setting him back did not fit the training regimen. I found myself worrying about what to do and realized I might miss a rare opportunity to stir my son’s interest in the dogs if I didn’t allow him to run the pup. With that realization, the answer came easy: to heck with the training regimen let’s see them run! Lori and I were off to the field with the boy and the dog to show them a few things and see how they might do. I planted some clip-wing pigeons, explained a few things to John and got the pup out for him. I knew I’d have to stay out of view if the pup was going to respond to John, so I climbed back into the pickup cab. John lined him up and, on the first cast, Jake made a beeline to the truck - jumped into the bed, put his paws up on the dog crate and peered at me through the back glass. Well, after a good chuckle we replanted further away from the truck and Lori had John throw a few dummy retrieves for Jake to get his mind off my whereabouts. That worked better. The pup quartered nicely for him, brought the birds directly to him and delivered perfectly. After a few more quartering sessions, it was evident that the difficult part would be getting John to recognize when Jake was making scent and learning to move up quickly to put the gunners in a better position when this occurred. I also hoped Jake would remain steady for him - but if not, it was only the junior test. We arrived at Spivey early Friday for a training session. John got some coaching from Don Bramwell over some flyers and then he was off to chase lizards with the two other boys attending that were close to his age. On Saturday morning, we were there early and as Test Chairman, I was busy making sure things were getting done... or at least acted like I was. John’s grandparents, who had flown in from Florida, arrived about that time and I outfitted them with some blaze orange. Then I was off to stake the Junior - Senior course. John had a great time driving the Polaris Ranger while helping me. So far, he was having a blast. John and the pup were scheduled late in the running order so he was able to watch a few dogs before they ran. He got the pup out of the crate while I was out of view. Then they, Lori and the grandparents walked off toward the gallery. A very nervous dad followed far behind. I remembered how nervous I was the first dozen or so times that I handled dogs in test and trials, so I was particularly proud to see how he stepped out front when they called them up to the line. After the usual directions from the judges, he cast Jake off and handled the pup just fine. Jake quartered nicely, made a nice master level retrieve or two. When John raised his hand and hit the whistle to hup Jake for a polished delivery I thought, "Hey what’s this? I can’t even get that pup to do that!" They finished to a round of applause that most importantly put a big smile John’s face. From there he went back to chasing lizards and playing cards with the other kids while I did my thing. The water test was not without its stressful moments. Jake marked the junior fall perfectly and made a direct return to the shore. At the moment the pup touched land I was thinking, "John - hit the whistle now," but he didn’t. Jake stopped and dropped the bird to shake. He then noticed the pickup dog behind the judges and took a foray over to her. We were all holding our breath. After what seemed like an eternity, the judge quietly told John that he needed to do something to encourage the pup to complete the retrieve. John then remembered the whistle. Jake returned to the bird, picked it up and completed the retrieve with a nice delivery. One ribbon down! On day two, the second test went basically the same for the pair with another passing performance. Handing him the ribbons during the awards ceremonies was a special treat for me. The whole weekend was a success - largely due to the supportive efforts of the judges, handlers and other adults present. It was also a success from the standpoint of lighting a spark of interest in the boy. He looks forward to placing a title on the pup during this September’s hunt test and earning the AKC’s junior handler certificate. Brad Mirth resides in the southwestern Oklahoma town of Duncan. Always an avid hunter, he is a relative newcomer to dog training, field trialing and hunt tests. He is a member of the N.E. 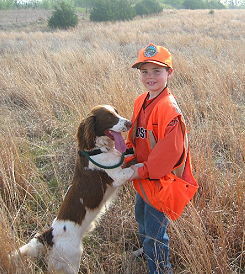 Oklahoma English Springer Spaniel Club and the Springer Spaniel Club of Central Kansas. 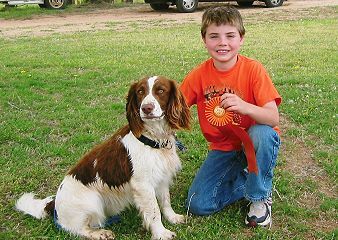 He aquired his first Springer about 5-1/2 years ago from the late Paul Black of Houston, Texas, and got hooked on the spaniel games shortly after. He credits his wife for enduring his preoccupation. He was introduced to the sport by Cliff Hankins (long time veteran) of Oklahoma City and credits Cliff for enduring the early days on his learning curve.